One Foot Tsunami: Free Confetti! 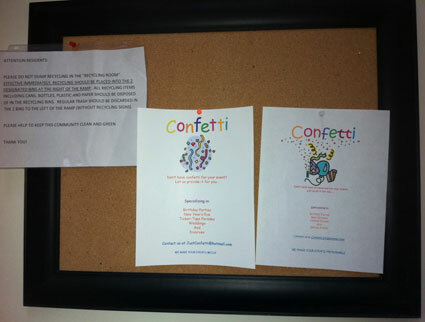 Recently, while hanging around my mail room waiting to try out a killer “package” line on cute girls picking up their mail, I noticed a flyer on our communal bulletin board. It read “Confetti” in bright, cartoonish letters. “Free confetti?”, I stupidly muttered out loud. Fortunately, none of the aforementioned cute girls were around at that moment to hear my confusion. So, undistracted by the beauty of the feminine form, I examined the flyer more closely. 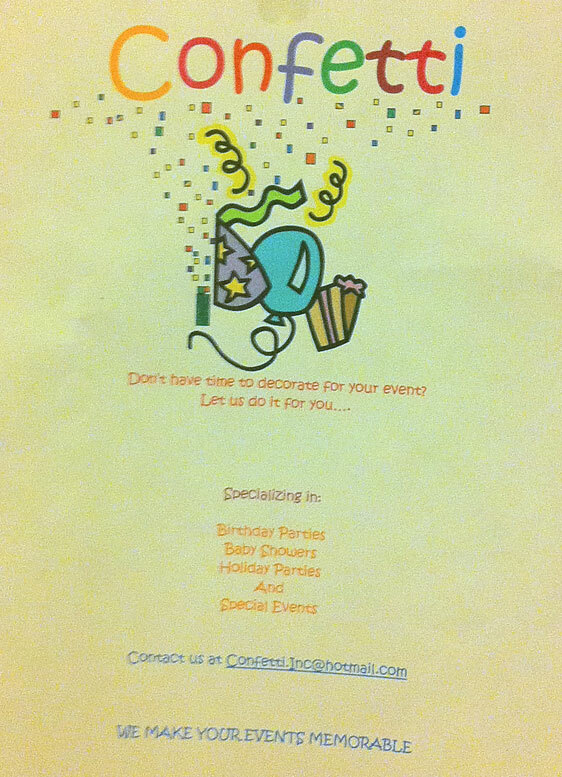 As you can see, it turned out to be an advertisement for a party decorating service. I had no idea a market for such a thing even existed (and I suppose I still have no proof that it does), but someone in my area is apparently making a go of it. As my mind wandered back to my original idea, I realized two things. First, I didn’t have much going on that day. 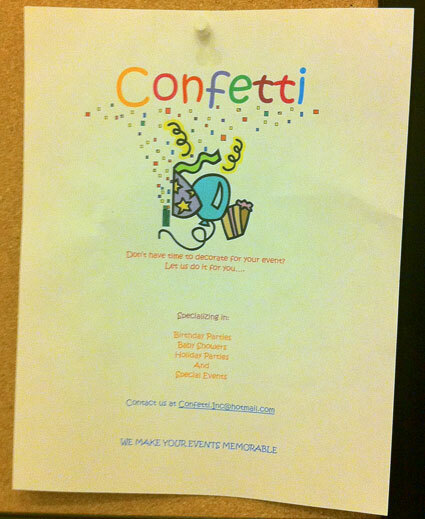 Second, a flyer dedicated solely to providing a trivial item like confetti is an amusing idea. 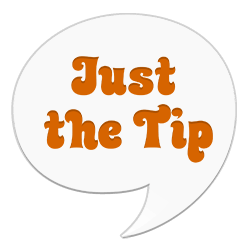 A disgusting majority of the time spent making this was wasted on trying to find free clip art (eventual source: Microsoft Office’s online site). The next most time-consuming task was confirming that Hotmail still existed, and then registering a spoof Hotmail account. Coming in at a distant third was the actual creation time for the flyer’s text. Once I had the flyer printed out, all I had to do was take a shower, shave, comb my hair, and apply the standard 7 spritzes of fragrance. As most men know, it’s important to look (and smell) your best in the mailroom, even while engaged in monkeyshines. So two and a half hours of personal hygiene later, I headed back, simultaneously ready to post my flyer and woo the ladies. 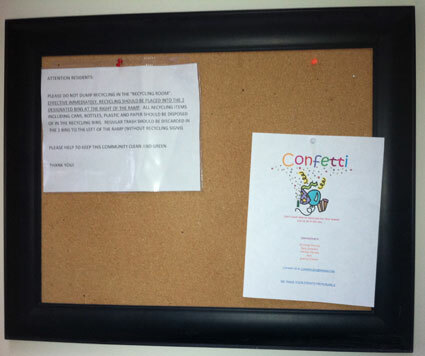 Using a thumbtack already on the board, I got my spoof flyer up next to the original, and snapped a fast photo. Pleased with my work, I made a quick escape, heading over to CVS to purchase my weekly shipment of cologne. While it would have been nice to witness reactions to this flyer, I was content in knowing it would cause confusion and amusement for at least a few days. Whether the original poster was shamed into removing his flyer, or someone assumed it was fake, I’ll never know. 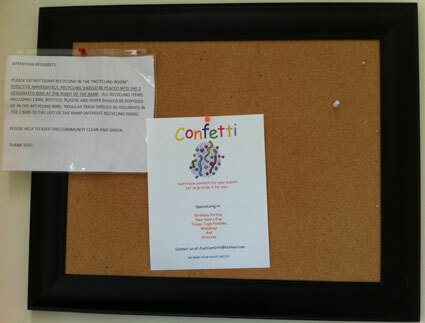 For now, I’m still waiting to hear from JustConfetti’s first potential customer.